Hello Everyone! It’s day 4 of the coloring challenge. Today is a another warm day. It’s strange to have warm temperatures in February but I think some snow is coming soon. I woke up not feeling well rested today and that voice (you know, the one in our head that tells us negative stuff.) was talking loud. It suggested strongly that I take a day off from the gym. Normally I ignore her but today, she had so many ‘convincing’ arguments, so I caved!! So after I dropped off the boys, she continued to talk and I told her I needed to stick to the challenge and that although a blanket, a book and tea on the couch sounded extremely inviting, I have a commitment so I headed to my craft room. I selected a Penny Johnson stamp from Stampavie that I have had way too long and it was still unused. So I cracked the seal and started thinking of what to make. I decided I wanted to make a window card with a Valentine or Love theme. 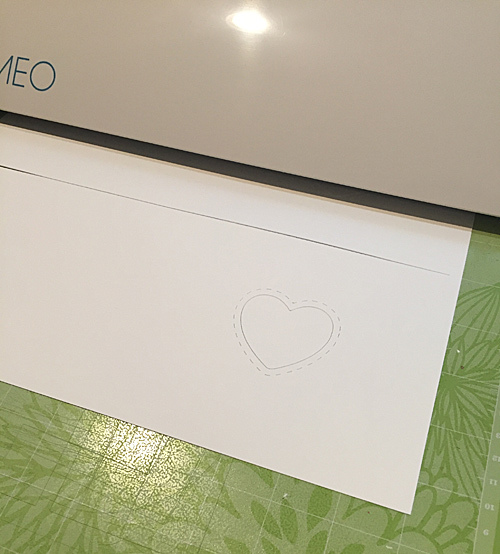 So I opened up my Silhouette Designer software and made a 4 1/4 x 5 1/2 card base with a heart on the front. 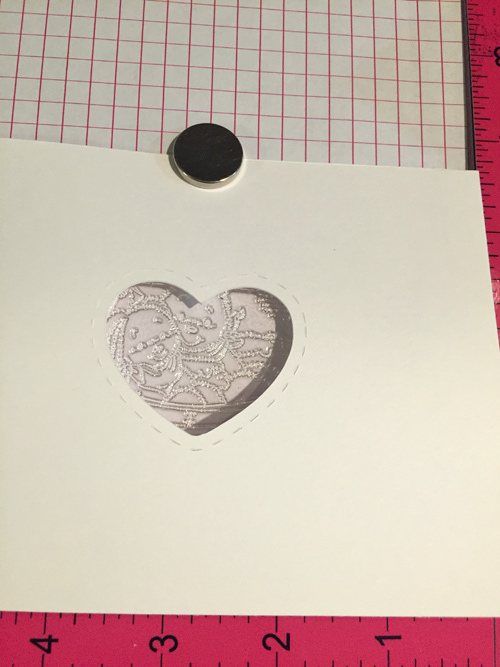 I love the dies with the stitching included so I used my Offset tool to create the same affect on my heart. I tested it out to make sure it would show just enough of the image to secure interest. Then I cut out two cards on my heavy duty cardstock. 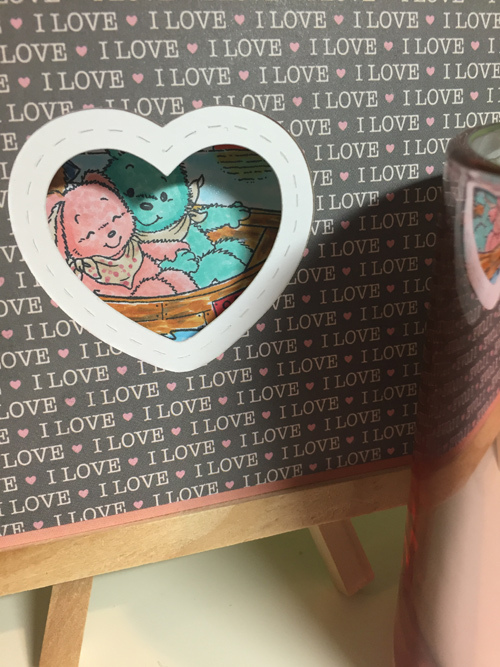 I used my Misti to align the image properly with the heart window before I stamped it on my XpressIt paper. Then I stamped up the image and made a few extra for future cards. I decided to add pattern paper from Carta Bella’s ‘ Words of Love collection to the front of the card because it was to bare and I didn’t feel like stamping a sentiment on the front so I chose a pattern paper with words. 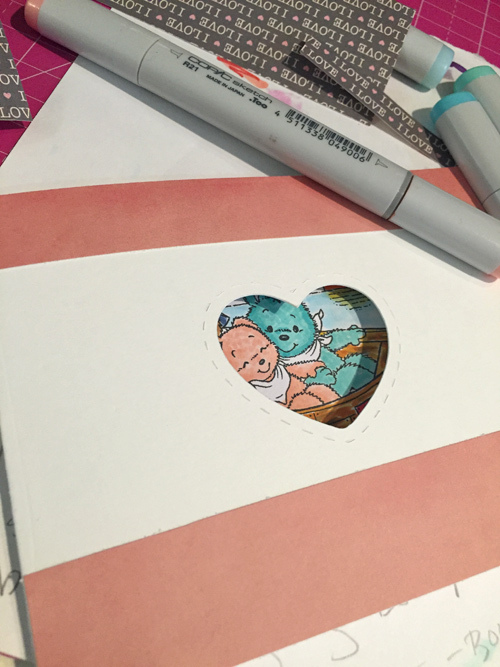 I first added to complimentary colored strips from Basic Grey’s True Love collection to the front of the card to add further dimension. I really love the stitching so when I created another file to cut out a heart window for the front, I enlarged it so that you will still see the beautiful stitch lines. I love when I make files like this because I can use them over and over for different projects. I colored up the image with my Copics and tried out a new color combo for the wood on the boat. This image provided me with another opportunity to work on this technique. It was also my first sunset. Something I will continue to practice moving forward. I used clear Wink of Stella on the water for shimmer. Overall, I like how it came out. I hope you are having a great day! I am glad I didn’t listen to that voice so I had time to play with my markers. 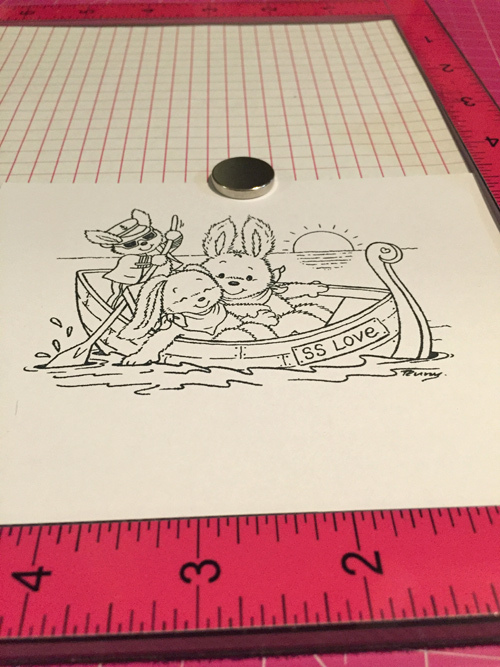 As a bunny lover, I adore this one!